Children age 3 and younger are not permitted to ride. Looking for high-speed adventure? Soaking wet spinouts? An instant adrenaline rush? 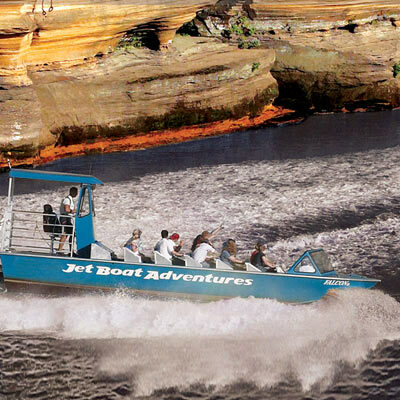 Welcome aboard Jet Boat Adventures – Wisconsin Dells’ premier jet boat experience. Our amazing watercraft transports you on 50-minute tours packed with awesome maneuvers and fantastic natural scenery – a combination as powerful as our 1,200-horsepower engines. Hop aboard for excursions on the Upper Dells and Lower Dells of the Wisconsin River. We bring the speed – you have the fun! Please call 608-254-8555 for departure times. All tours based on weather and water permitting.